This article is part of a series covering changes in personnel during the summer of 2012. 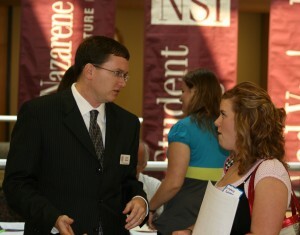 In June 2009, Chris Peterson began his role as Director of Career Services and Student Employment. On August 14th, he started his new role as Director of Human Resources (HR). With this change, details about the future of the Career Center remain to be announced. The position of Director of HR became available when former director Rick Powell opted for the university’s Voluntary Transitional Retirement (VTR) plan. Powell will continue to work up to half-time for up to three years, ensuring a smooth transition as Peterson settles into the role. Peterson comes in with some previous experience in HR. “When I first got out of college, I worked in HR. I have had some HR responsibilities in all my jobs,” Peterson says. Peterson applied as an internal candidate when a public search was made to fill the position and was interviewed in late June. He had already earned Powell’s high regard by that point. “Several months ago Chris came to me and asked about this position. I truly got excited when I told the administrative officer that he was interested in transferring. There is no one I would recommend more than Chris to be taking my place. He has already earned the respect of the campus. He has proven integrity, and he is a proven leader,” Powell says. A university-wide search committee selected Peterson unanimously, incoming Vice President for Financial Affairs Dr. Scott Strawn says. Peterson served under Strawn while in Student Development and will continue to as a result of Strawn’s new role. As the director of HR, Peterson will be responsible for a broad portfolio, including hiring, benefits, firing, payroll/compensation, employee orientation and training, grievances and complaints, and the new wellness/health program. “He will really help our employees…and students want our employees to be happy because happy employees do better work, so he’ll do a great job,” Strawn says. With Peterson switching to HR, the future of the Career Center has yet to be announced. “It would be great to have [the position of director of Career Services and Student Employment] filled fast for the benefit of our students and businesses,” Peterson says. Peterson says that though employers can currently post jobs directly, this does not replace the position. Though plans have been formulated, few details have been announced. “We’ve got some plans. When I say we, certainly it’s Mike Redwine’s [incoming VP for Student Development] plan at this point, and he’ll be making some announcements about this in the near future. We’re working on a way to cover some of those responsibilities in the interim, and we feel pretty good about that. But, I think we’ve got some exciting plans,” Strawn says. “What I feel comfortable saying at this time is that Chris Peterson’s position will be filled, but the job description is likely to be reconfigured as we work to complete the overall transition in Student Development,” Redwine says. Who is this Peterson guy? He sounds like a cool cat!